The Deputy Director General of Meteorology is the Head of the Regional Meteorological Centre, Nagpur. There are two Meteorological Centres. viz. Bhopal and Raipur headed by the Directors. In addition to the Meteorological Centres, different types of operational units such as Regional Weather Forecasting Center (RWFC) and Aerodrome Meteorological Office (AMO), Doppler Weather Radar, Telecomunication (AMSS) Unit, RS/RW & PBO Unit, Climatological and Data Supply and Agrometeorological Advisory Unit and few more units functions under the administrative control of Deputy Director General. There are 17 Departmental Meteorological observatories, 47 Non-departmental Meteorological observatories, six Agro-meteorological observatories and three Seismological observatories functioning under Regional Meteorological Centre Nagpur. 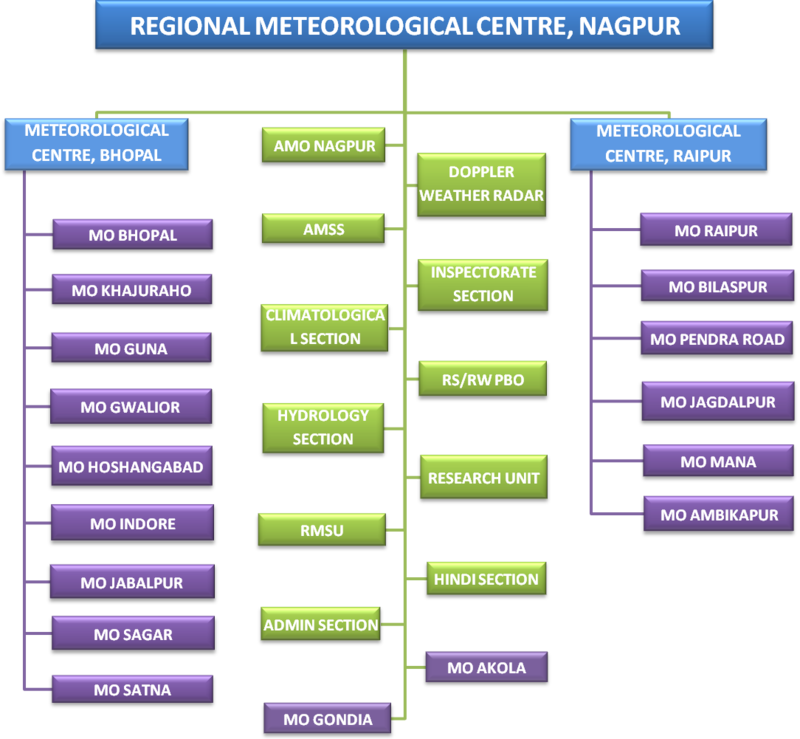 Regional Meteorological Centre Nagpur covers Madhya Pradesh, Chhattisgarh and Vidarbha.